From cosy hideaways to floppy beach breaks and luxurious nooks to curl up fireside, travel writer Kate Gibbs names the top winter escapes to book right now. At the beginning of a particularly gloomy winter, when sparkly postcard days are replaced by stormy weekends and shadows are cast, our minds inevitably wander into escape territory. At this time of year, I scan Instagram and travel blogs as Europeans, Americans, pretty much everyone except us antipodeans, slip into bright bikinis and aqua blue pools, cool down in rocky outcrops and turquoise waters. When the cold sets in, it’s hard enough to actually make plans to travel let alone leave the warm nook on the sofa by the heater. So, I’ve done the hard yards, taken holidays and traipsed around the best luxury winter escapes in Australia and abroad. All you need to do is shed those glamorous sheepskin boots and get out the door. 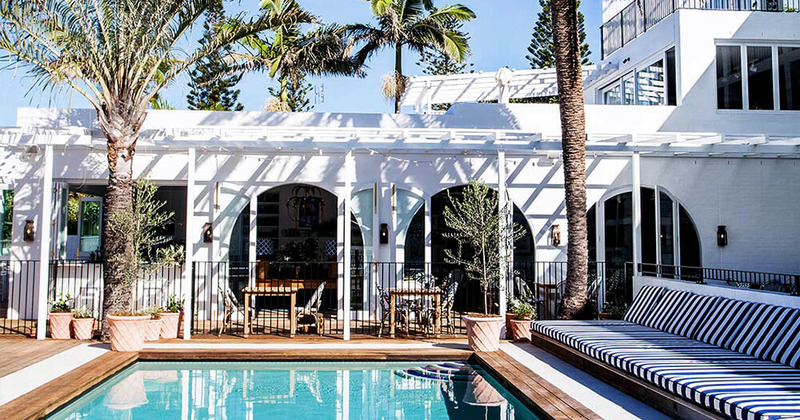 Cabarita Beach was little known beyond locals and itinerant surfers until the boutique, design-led Halcyon House opened to become a stay that gives even nearby popular Byron Bay a run for its money. An old motel has been given a new lease of life in this 21-room property, newly decked out in fanciful, nostalgic antiques, art and furnishings so original that no two rooms are the same. Noma alumni Ben Devlin takes the helm at the in-house restaurant Paper Daisy, offering summery Australian dishes such as green rice fried prawns with chilli and ginger pickle salad, and coal-roasted fish with finger lime dressing. Arrive at the bright boutique digs, be greeted with a cold towel and a glass of Champagne, and an ice cream cart offering flavours made daily by the chef. Rooms wrap around a central lap pool, and everything looks out to the beach, light reflecting off every white-washed wall and promising a summery winter escape right now. After a Robinson Crusoe-style getaway but not so keen on that whole stranded-on-a-desert-island thing? 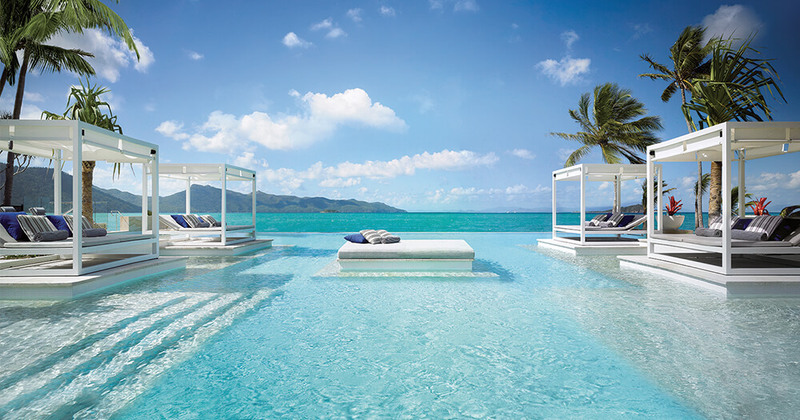 Hayman Island is the best place in Australia for you. Even the pool of this Whitsundays-based resort is an idyllic summer vacation that promises to warm your chilled bones in the wintery months. Private decks overlook the stunning Hayman Pool, and each morning polished staff busy themselves with tasks vital to your relaxation; distributing rolled towels on sun lounges and angling sun umbrellas. Go barefoot everywhere here, and then up the ante to Chanel espadrilles or heels at night - this is the best of all worlds. Set in the long stretch of the Great Barrier Reef, the resort offers windsurfing, paddle boarding, catamarans and a hair-raising assortment of power water sports. Go for a beach villa with pool if the wallet will allow, arguably the most luxurious family accommodation in the country. Being stranded here wouldn’t be so bad after all. So it’s winter. 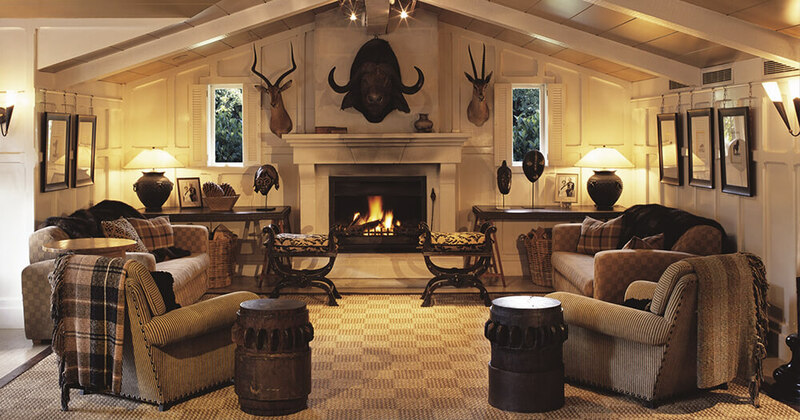 Accept the facts and do the season in style at the luxurious Huka Lodge in New Zealand’s Lake Taupo, where green blankets of lawn tumble into the bright blue Waikato River, and a bubbling deep brook outside most rooms turns into a roaring river that has aspiring and expert anglers reaching for their rods and the local rainbow trout. There’s no checking in here, it’s just a welcome Champagne by the fire and a moment to plan the stay. There’s nearby skiing in winter at the North Island’s premier slopes and natural hot pools bubbling with volcanic heat. But the real winter escape comes in the warm lodge-style rooms and lavish Alan Pye Cottage and The Owner’s Cottage - some with their own roaring indoor and outdoor fires. The boutique property, looked after by Mr and Mrs Smith, has you living momentarily like Brad Pitt and The Queen of England. Indeed, you may even see them there. With temperatures hovering between 10 and 28 degrees in winter, the red heart of Australia is beating strong as a warming destination at this time of year. Sunshine by day and outdoor fires by night, views across the desert to Australia’s favourite rock and spiritual Uluru, Longitude 131 is a luxury destination for well-heeled travellers with a lust for the outdoors. 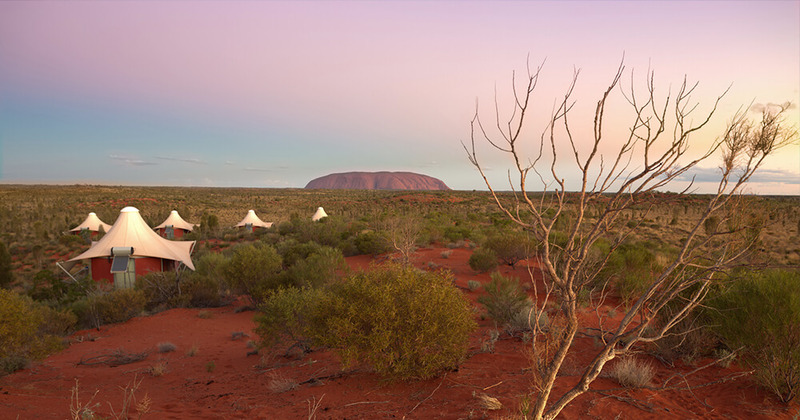 Fifteen intimate tents are elevated above rust-red dunes, and guests wake to the site of Australia’s most iconic view, the red rock Uluru. Wilderness treks, helicopter, camel or Harley Davidson rides, bird and flora tours, star gazing, and Aboriginal dot-painting workshops are all on offer. 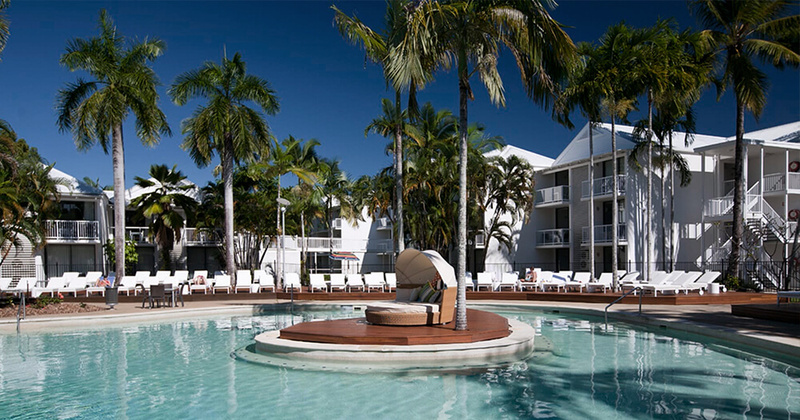 Everything is hot at this super cool Port Douglas resort with a fashionable edge. Not only is this place set in the tropics, a moonlight cinema runs from June to October on the QT’s lawns, there’s an open-to-the-tropics poolside bar, guests have access to retro bikes for local cycles, and the mini-bar includes the usual snacks as well as beach balls, sunscreen and underwater cameras. All the more reason to hit the local Four Mile Beach. In the winter months, this stretch of sand turns from a no-go zone of deadly stingers to a place locals and tourists alike can wade and kite surf. It’s the best of summer in the middle of winter. Enjoying Kate's Travel, Tourism and Hospitality articles? Read her most recent pieces here.